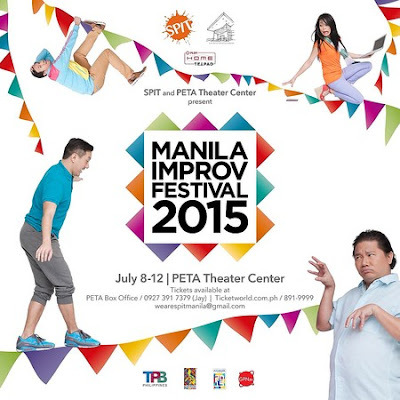 Silly People’s Improv Theatre (SPIT) is the country’s premiere improvisational theatre group known for their smart and incisive brand of comedy. Considered as one of the best improv comedy troupes in Asia, SPIT has had almost a thousand performances in the last decade to both local and international audiences whose combined numbers easily run up to the thousand. 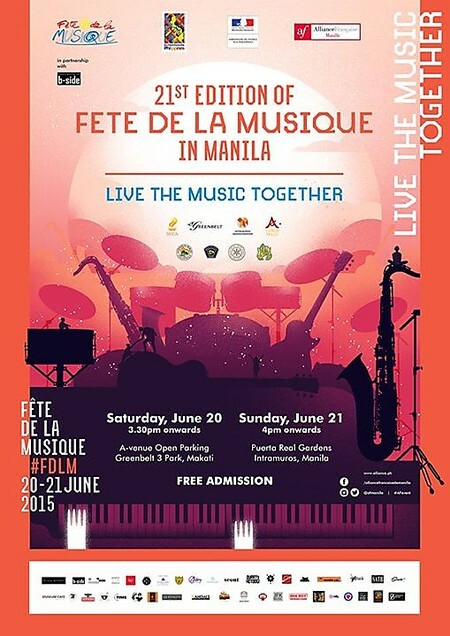 SPIT has represented the Philippines in the Los Angeles, Beijing and Hong Kong Comedy Festivals, and the Improv Festivals in New York and Chicago, and more recently, the Amsterdam Improv Festival in January of this year. 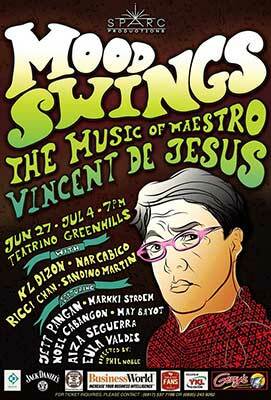 SPARC Productions presents Mood Swings: The Music of Maestro Vincent A. DeJesus in the concert on June 27 and July 4, 7PM at Teatrino, Greenhills. 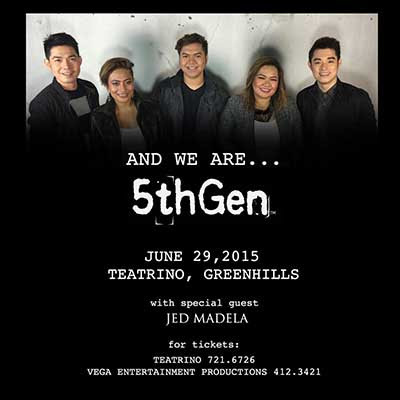 Catch his unguarded moment, together with his closest friends as they celebrate the beauty and tragedy of love through songs that will make sure you get your own share of “hugot.” Catch KL Dizon, Nar Cabico, Ricci Chan, and Sandino Martin together with Jett Pangan, Markki Stroem, Noel Cabangon, May Bayot, Aiza Seguerra, and Eula Valdes as they perform his beautiful creations. 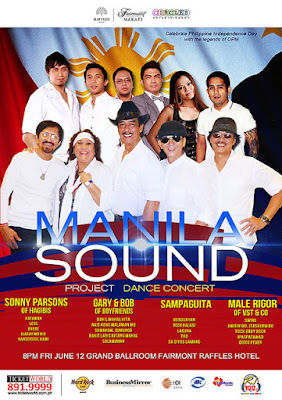 Tickets are at 1,800, 1,200 and 800. For ticket inquiries, please call Marco at (63 917) 537-7788, Ellaine at (63 935) 243-9262 or Teatrino at (63 2) 721-2949 and (63 2) 722-4501 loc 116. 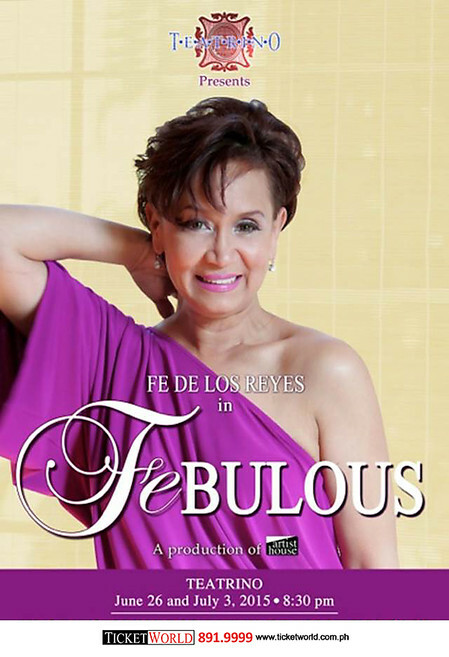 Presented to you by Artist House and Teatrino, come and watch comedienne, actress and singer Fe De Los Reyes as she’s being “FEbulous” on June 26 & July 3, 2015 at Teatrino. For ticket inquries, please call Ticketworld at (63 2) 891-9999. Resorts World Manila in cooperation with Ultimate Shows, Inc. presents ZsaZsa Padilla "Beginnings" with special guests Martin Nievera and Karylle. 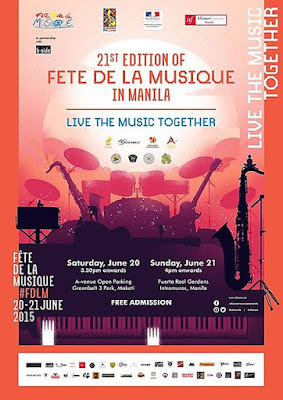 Musical Director: Homer Flores on July 31, 2015 at Newport Performing Arts Theater. 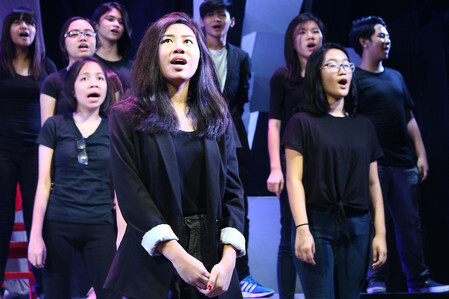 The Philippine Educational Theater Association (PETA) just ended its annual Summer Program but aspiring thespians need not fret as PETA readies for a variety of workshops available year round. PETA, not only known for its hit productions, also prides itself in being a strong believer of using educational theater as a means of empowerment and self-development. PETA will be offering three different educational programs suited for all kinds of aspiring stage performers: PETA's Workshop Weekends for working professionals, PETA's Professional Acting course for advanced performers, and the PETA Summer Program for kids and teens. Mario Lanza preceded top three tenors Jose Carreras, Placido Domingo and Luciano Pavarotti. 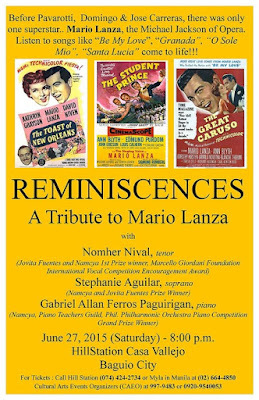 This American-Italian singer, influenced by Enrico Caruso and gifted with a dramatic operatic voice, reached in the ’50s the rock-star status of Elvis Presley, The Beatles, even of Michael Jackson. He was king of the record industry, had his own national radio show and starred in box-office before his death under mysterious circumstances. 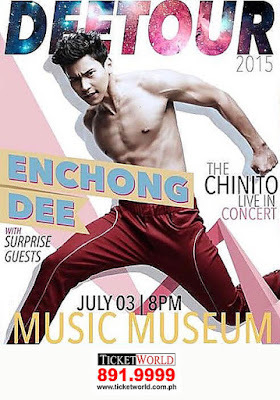 Get ready for one hot concert as Kapamilya Hearthrob Enchong Dee is set to have his very first concert at the Music Museum dubbed as Deetour: The Chinito Live In Concert this July 3, 2015. 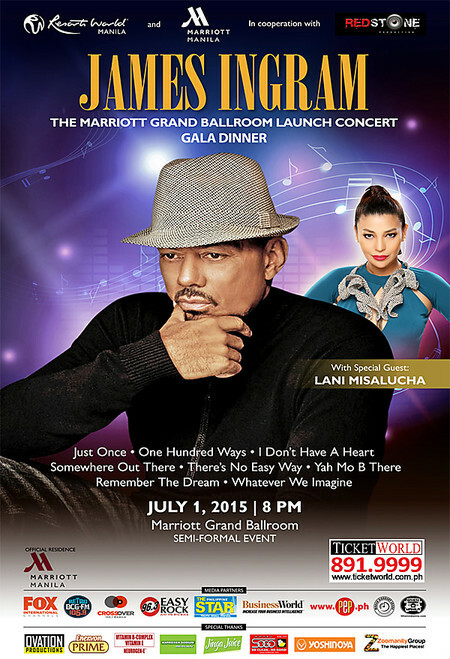 Resorts World Manila, Marriott Manila and Redstone Media Production, Inc. presents "James Ingram Live in Manila" on July 1, 2015 at Manila Marriott Hotel with special guest Lani Misalucha.